Here comes another warming, healthy and vegan recipe for you that is super easy to whip up! Full of nutrients and guilt free – both of excess calories fat and animal cruelty! What could be better?! A few notes: Chipotle in adobo sauce are cans you can find usually in the Latin section of your grocery store – they add spice but also actually a wonderful “meatiness” without the meat – in fact when I’ve served this to people before many people think I’ve added bacon! So chipotle in adobo is my “secret” weapon to adding depth of flavor to my dishes. You can play around with different beans; black eyed peas, red beans, chickpeas etc but I find that black beans work particularly well in this dish. Black beans are low in fat and contain a whooping 15 grams of protein per serving and is a great source of fiber. I always toast my spices (I use whole seeds/pods) and then grind them up right before I add them into the dish I’m making – this makes the food so much more fragrant and always switch out your spices in your cabinet every 3 months! (Mine never last that long because I spice up every single dish I make!). Think that was all I wanted to include before giving you the recipe – as always, I love feedback and comments and hope you will try this one out! Happy cooking! Gently toast the coriander and cumin seeds in a dry skillet over medium-low heat until fragrant – about 1-2 minutes. Add them into a coffee grinder and grind up. Set aside. In a large pot, heat a couple of tablespoons of olive oil and add the sweet potatoes. Season with salt and saute them on medium high heat for a few minutes until they start to soften. Remove them from pan and set aside in a bowl. Add a bit more oil to the pan and add garlic cloves. Let them sizzle in the olive oil about a minute before adding the spices and coat them with the olive oil. Add the onion, season with some salt and saute the onions about 5 minutes. 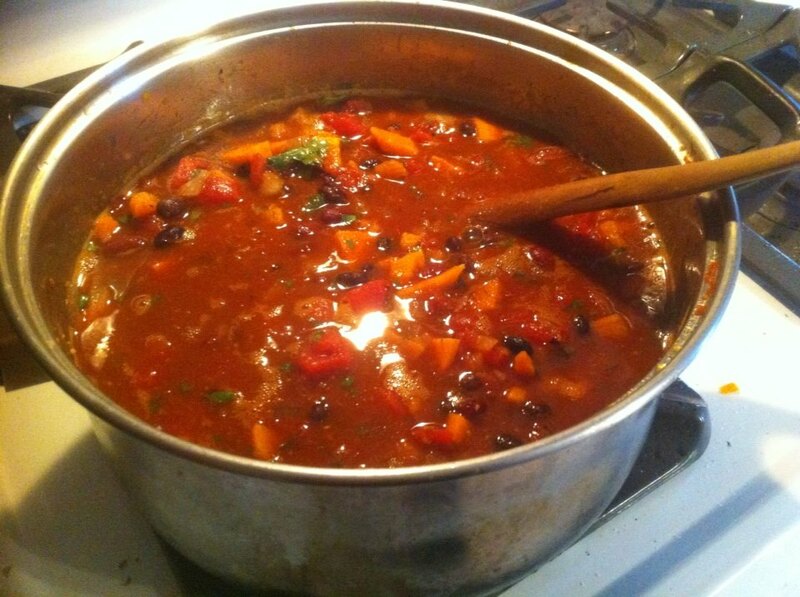 Add in the chopped chipotle chilis, the chopped tomatoes, sweet potatoes and black beans. Season with salt and let simmer for about 15-20 minutes to combine the flavors. Right before serving add in the lime juice and fresh cilantro. Season again with salt if necessary. Serve with rice or tortillas – this is a great winter meal!! Have a very Merry Christmas and a Happy New Year, Sunny!! do you have more HEALTHY recopies that lazy cooks like me can make? thanks! Will make the bean soup ASAP. I can smell it!